Most people hate having to create new passwords to register on each site. OpenID, is one solution to this problem, by providing an identity that can be used across the internet on any site that supports OpenID. More and more sites are integrating with OpenID to offer their users an easy and convenient way to register or sign in to their sites without having to establish new passwords. mojoPortal content management system provides support for OpenID out of the box, all you have to do is enable it from (key icon) Administration Menu > Site Settings Security > OpenID. Since OpenID will both sign in existing users, and register new users, you must also have the Allow New Users to Register checkbox checked for it to work as intended. as you can see a lot of major sites have integrated with OpenID and if your vistors already have an account at one of these sites they can sign into your site using their existing password. 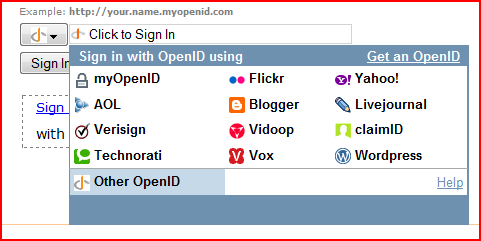 If you want to get an OpenID that you can use to login to more and more sites on the internet, myOpenID.com is a good one I recommend. Enabling OpenID provides an additional way for users to sign in orregister on your site. They can still use the traditional way if they want to create a new password for your site. If this is set to false, the Open ID Tab will not be displayed in Site Settings.